How does one know if a study is ‘flawed’? I see a lot of posts on here that say a lot of major studies are flawed. How? Why? What’s the difference if I am gullible and believe all the flawed studies, or if I (am hopefully not a sucker) believe what the Fat Heads are saying and not to believe the flawed studies — eat bacon. It’s hard to know how healthful the original diet, a “carbohydrate-rich diet used in the DASH trials … currently advocated in several scientific reports” really is if removing carbohydrate improved everything. Generally, understatement is good. One of the more famous is from Watson & Cricks’s 1953 paper in which they proposed the DNA double helix structure. They said “It has not escaped our notice that the specific pairing we have postulated immediately suggests a possible copying mechanism for the genetic material.” A study with the word “healthy” is an infomercial. The Watson-Crick paper cited above had the diagram of the double-helix which essentially became the symbol of modern biology. 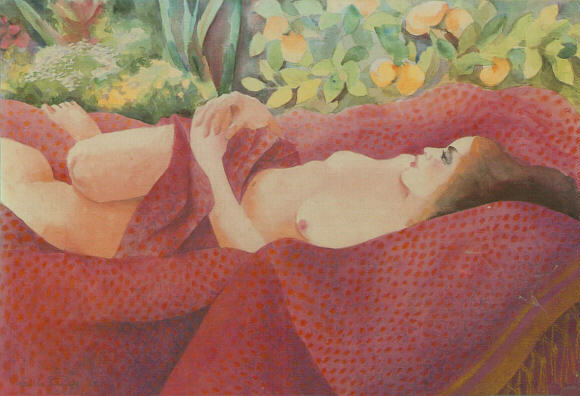 It was drawn by Odile, Francis’s wife, who is described as being famous for her nudes, only one of which I could find on the internet. Krauss, et. al. 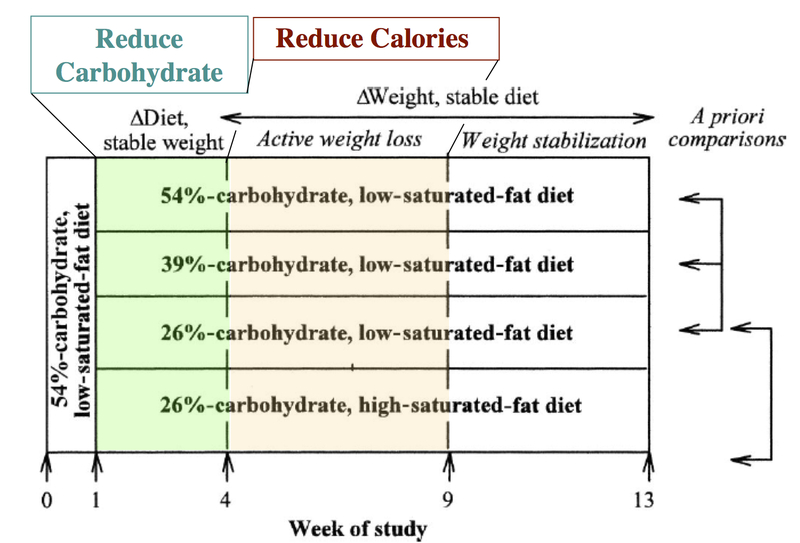 Separate effects of reduced carbohydrate intake and weight loss on atherogenic dyslipidemia. The absence of a figure may indicate that the authors are not giving you a chance to actually see the results, that is, the experiment may not be flawed but the interpretation may be misleading, intentionally or otherwise. An important illustration of the principle is a paper published by Krauss. It is worth looking at this paper in detail because the experimental work is very good and the paper directly — or almost directly — confronts a big question in diet studies: when you reduce calories by cutting out carbohydrate, is the effect due simply to lowering calories or is there a specific effect of carbohydrate restriction. The problem is important since many studies compare low-carbohydrate and low-fat diets where calories are reduced on both. Because the low-carbohydrate diet generally has the better weight loss and better improvement in HDL and triglycerides, it is said that it was the weight loss that caused the lipid improvements. So Krauss compared the effects of carbohydrate restriction and weight loss on the collection of lipid markers known collectively as atherogenic dyslipidemia. The markers of atherogenic dyslipidemia, which are assumed to predispose to cardiovascular disease, include high triglycerides (triacylglycerol), low HDL and high concentrations of the small dense LDL. The Abstract of the paper describes the outcomes and the authors’ conclusions. Conclusions: Moderate carbohydrate restriction and weight loss provide equivalent but non-additive approaches to improving atherogenic dyslipidemia. 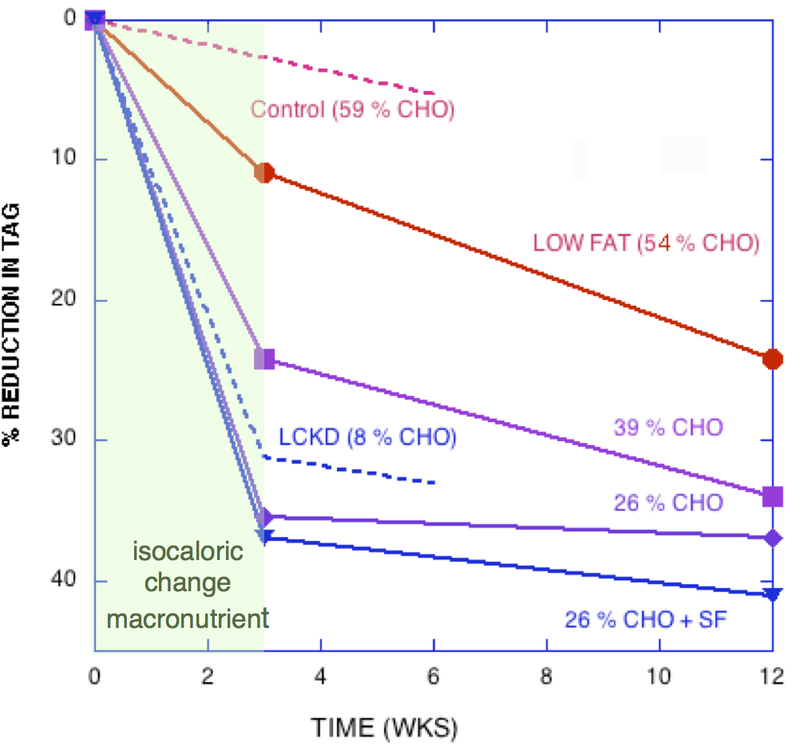 Moreover, beneficial lipid changes resulting from a reduced carbohydrate intake were not significant after weight loss. It’s not hard to see what the data really show: Reducing carbohydrate has an overwhelming effect on triglycerides even without weight loss. When weight loss is introduced, the high carbohydrate diets still can’t equal the performance of the carbohydrate reduction phase. (The dotted line in the figure are data from Volek’s earlier work which Krauss forgot to cite). Summary Although some effort is required to disentangle the data and interpretation, the recent publication from Krauss et al. should be recognized as a breakthrough. Their findings… make it clear that the salutary effects of CR on dyslipidemia do not require weight loss, a benefit that is not a feature of strategies based on fat reduction. As such, Krauss et al. provides one of the strongest arguments to date for CR as a fundamental approach to diet, especially for treating atherogenic dyslipidemia. This is remarkably good agreement for a nutrition study. When you consider carbohydrates as the independent variable, you can see what’s going on. Or can you? After all, by changing the variables you have only made an association between carbohydrate and outcome of an experiment. So does this imply a causal relation between carbohydrate and triglycerides or not? It is widely said that observational studies do not imply causality, that observational studies can only provide hypothesis for future testing. It certainly seems like causality is implied here. It will turn out that a more accurate description is that observational studies do not necessarily imply causality and I will discuss that in the next posts. The bottom line will be that there is flaw in grand principles like “Random controlled trials are the gold standard.” “Observational studies are only good for generating hypotheses,” “Metabolic Ward Studies are the gold standard.” Science doesn’t run on such arbitrary rules. Good article Richard. Nice to know some people are trying to make science better. I would be interested in more info on how to best plan and control studies (especially diet studies) to ensure the results are statistically significant. I think we need to recognize statistics as our servants not our masters. That will be the first step. A major flaw in published papers is mindless use of statistics without the intervention of common sense. You have a wonderful talent for reading the literature. I would have given up. The causality vs correlation issue in the literature is rampant, let alone what the public receives. These people must believe that roosters make the sun come up since it happens with 100% reliability. Scientists need to ask what experiment will disprove their hypothesis and then do it. People seem to have lost sight of the fact that you can’t prove a hypothesis. If you test comes out as predicted you learn nothing, although it does change your confidence. But you only learn when the hypothesis fails. No experiment can disprove the diet-heart hypothesis. When the experiment fails, it is because there were insufficient numbers of subject to provide the appropriate power (translation: we are applying for an even more expensive grant). Excellent! I can hardly wait for the next instalment(s). I particularity like the understated quote from Watson & Crick — brilliant! For me an healthy dose of humility is often a good sign of a credible scientist. People thought that they were being coy but Watson said someplace that it was that they weren’t sure that they had it exactly right. The most important sign of a credible scientist is that you want to get it right. Dr Feinman thank you for posting such an informative article on the matter. I am sure you are aware of the classic paper by Ioannidis that most research findings are false. This comes to confirm once again that sometimes conclusions are drawn well before the findings. Yes. In nutrition we have recommendation-driven research rather than the other way around. Recommendations are made and then people do the research to support them. Peer review is provided by the people who made the recommendations in the first place. I never realized how hard it was to reach the public with the truth until recently. I’ve been involved with a company that is trying to make a commercial for a new sweetener. The script had to be rewritten multiple times to be sure it would satisfy the Federal Trade Commission. It seems you cannot say anything about sugar except that it has calories and carbs and can cause weight gain. And you cannot say that you can lose weight without exercize, because that is impossible. They are all honorable men. Alright, let’s stipulate that every word you wrote is true without qualification. Agreed? Agreed. Can you show us a study that meets your requirements and proves that Homo sapiens scorbuticus needs dietary sugars? I am not referring to the essential sugars, just the rest of them. I am very impressed with your post; it gives me something to aspire to. If anyone can answer the above question, surely you can. She makes a similar case for careful scrutiny of innovations. I assume that includes HFCS. Best wishes and keep ’em coming! I stipulate but I am not sure what you are asking. I don’t know that there are essential sugars and as for non-essential sugars what is the relation to scurvy? As for the rats in the maze, in nutrition it is easy to lose track of where you are. Thank you for taking the time to post your response and so promptly. I appreciate it greatly. I don’t know what your posting policy is but if I overstep it, I have no objection to vigorous editing; it’s better than being deep-six’d. I’m not sure about glucose because, although it is listed here, it is made within the body by normal mammalian biochemical processes and is therefore not dietary. As you know, there is a small number of animals unable to synthesize ascorbic acid in vivo. Homo sapiens is one of them. Stone suggested that since this was due to a mutation, the scorbuticus descriptor should be added to Homo sapiens because an earlier version had this ability and the modern version does not. When Szent-Györgyi isolated vitamin C he thought it was a sugar, not a vitamin, thus, it too might qualify as an essential sugar, I’m not sure, but it is essential and cannot be made within the body from glucose as it was in the earlier version. Without a sufficient amount of this essential “sugar” in the diet, latent scurvy is chronic and frank scurvy is inevitable. The common lab rat doesn’t get scurvy and this limits its value as a human surrogate. A closer match is the guinea pig. If you can cite a study that shows a requirement for the non-essential sugars in human metabolic processes then there might be a case for deciding which one is the best and which one the worst. Perhaps you know of such a study. As to the maze problem, didn’t Jean Mayer also discover that rats fed on a high carbohydrate diet didn’t fare as well in the maze as their brethren fed on the standard rat chow of the day? I seem to recall a book on the subject. HFCS is a recent invention of the Japanese, I believe, and is chemically distinct from Karo corn syrup. It would not have been available for Mayer’s HSPH Dep’t of Nutrition experiments. Dr. Lustig’s source is correct. As quickly as I read your books, I send them on to my colleagues. I am looking for your latest. Are you familiar with the work of John Ralston Saul, your countryman? He, like you, has to use all his names because of the similarity between his and another fellow’s in the same line of work. He covers his territory as thoroughly as you do; I think it must be something in the education system or in the water, as they say. I recommend his work as well as yours to inquiring minds. By definition, you cannot show a requirement for something non-essential. The reference to missing-class-of-nutrients is far outside the mainstream of current biochemistry. There is enormous number of papers showing that almost all common forms of common sugars diminish vitamin C bioavailability, metabolic effects and so on. Glucose for instance competes with all types of C transporters both intra and extra cellulary. Fructose for instance seems to downregulate GULO gene in animals and and will also bioavailability of copper (and thus in some people lead to deficiency) which on its own can present as cardiovascular disease which will require more vitamin C to fix related mess. Furthermore it negatively regulate the innate immunity against viral and bacterial pathogens by interfering with mannose binding lectin. For other, less common forms of sugar or sugar-friends, chemicals that almost always come along with sugar (like policosanol), the situation is less certain and this is for me very interesting topic for which documentation is almost non existent to my knowledge. While those substances might not be essential in strict sense, they still could have great impact on health. Have you seen the study where the sugar fed rats ate the maze? This is some of your very best writing, clear as a bell; it ought to be in schoolbooks. All studies are imperfect perhaps; mainly to do with money and time; they could be larger, longer, more strictly supervised, use a different species/age/genotype; that is why studies are repeated with slight variations by the same researchers. But a study is really “flawed” when we can’t rely on the results, even if we agree with them. The abstract of a good study can be flawed, as with Krauss et al., without the study design itself containing the flaw. And so many studies, like Ludwig et al.’s recent one, are invested with flaws they never possessed by the media. Sure. Nothings perfect and Krauss’s study is a very good one. It is the political edge that made him underplay the results and prevent a real impact. But good to go with the data. In your presentation it seems to me that the concept “It certainly seems like causality is implied here.” should be listed as part of a third aspect in how to look at these studies. As you point out, science does not run under such arbitrary rules as are often posted, such rules generally being stated in the name of not claiming too much, a dangerous and misleading form of something like false modesty. When you get a straight line with the data neatly clustered, as in the final graph, it means a lot. First: Do the graphs and observational studies show that increasing the saturated fat in the diet reduces the “marker” for the disease (just another correlation, really, and no more) or actual reduction in the bad outcome itself? Second: “Causality” sounds a lot like “proof” in the legal world, of which I am a small part. In this legal context there is sometimes a lot of evidence, or forms of evidence, such as statements from witnesses, documents, timelines, and actions by the parties. Proof, or having something proven, is a judgment, and not something done by the evidence on its own. That is, “proof” (and I would say causality, too, in this context) is not a function of evidence on its own, but rather requires some external third party (a third party who is agreed by the parties to be the arbiter) to reach a conclusion. That is the function of the judge and jury. And sometimes they get it wrong. Thus, causality, like truth, and like proof, is a slippery concept. The reason we have a hard time with causality from observational studies is not because they do not prove anything, but because even double blind studies fall short of proving or showing causality. Obviously the studies measure what they measure, but even the double blind studies measure only what the study is meant to show or prove, etc., leading to mistakes and later re-interpretation. If there is no way the evidence can take us all the way to causality, we are left with various ways of getting nearer to the truth, with various levels of success and utility. And the other problem here is that we cannot trust our judges. Who are the judges? The media? The Department of Agriculture? In the end we have to think for ourselves. I think that there is much to learn in comparison with the legal system. I had several posts on “Evidence Based Medicine: Who Decides Admissibility?” which raise the questions you are asking and, yes, it is important, beyond admissibility of evidence, to have vigorous cross-examination and other practices. What is your relation to law? could any other conclusions be drawn from the data? what do your trusted sources have to say about the study? I’ve had some “very non-scientist” friends begin to read the media’s shenanigans critically! Good point – I’m not trying to suggest that people are being intentionally misleading, but when you enter a project with a preconceived notion and an idea of what you “should” show, it’s probably easy to be less critical or objective than you would have been otherwise. Of course but you can’t impugn the motives of the researcher because of the funding source. All granting agencies have priorities and interests and your grant application will undoubtedly try to cater to those interests but once funded, you have to report what you find and the agency has to expect that it may turn out differently than they hoped. Of course this is an ideal and there are many cases where it is not done but you can’t accuse the researcher without hard evidence. Unless the data you get contradicts your bias and you’re brave enough to admit it. Some of the best studies I’ve read were written up in a state of stunned surprise. Love the references to displaying info graphically. While getting my masters in applied statistics, I had a professor for regression analysis who often stated “regression without graphing the data is truly regression”. Seeing the plots can reveal so much. Sometimes not displaying the data is a kind of aggression, however passive. Thank you again for a prompt reply and thanks also to Frank G for his list of essential nutrients which does not show any evidence of carbohydrates as essential. The lists with which I am familiar show no essential carbohydrates either. If the 8 “essential” sugars are someday discovered by biochemists and cease to be a mystery, perhaps they will be added to the list. Wherein the harm? Oxidative stress is one candidate. If we pile on the sugar even where none is essential, the body must still metabolize it. The combustion process produces reactive oxygen species which must be quenched or else they can cause damage. When the spare electrons to neutralize free radicals without generating new ones are exhausted, the surplus is at liberty to go on its merry way. If glucose can’t be converted to vitamin C for the dual purpose of reducing the level of blood sugar and elevating the electron donor supply, oxidative stress, related to functional decline in brain structures, becomes a chronic condition. Is this not an argument for limiting dietary sugars to the vanishing point, just as Dr. Walford suggests? What!? Another possible source of harm was suggested by Dr.Rath when he pointed out that a surfeit of sugars in the blood competes with other similar molecules for building and repairing the structural components of the body. The substitutions produce imperfect versions and lead to premature failure. Not an appealing outcome in my book. I would like to point out that the best argument against dietary fructose is the preference of the bears. If Disney and National Geographic are correct, Ol’ Smokey gorges on a variety of woodland fruits in the Autumn and adds enough adipose tissue to last him through the long hibernation period. It is clearly Nature’s plan that we employ fructose and the other sugars found in fruits to ‘lard up’ for the winter. If winter never comes and we don’t do the long fast as the bear does, then the result is chronic obesity. Once obesity is established, reversing the condition is like trying to get the value of your stock portfolio back to the baseline after a crash. It’s a slow process. Mayer was partly right when he espoused exercise but the main advantage of a workout is to arrest the trend by “burning off” surplus blood sugar with vigorous training. While it’s true that exercise makes one hungry, why do we patronize the candy machines in the hall outside the gym instead of snacking on pemmican and pine nuts the way out leaner ancestors did? As long as i have your attention and the subject of bacon was brought up, have you read the ingredients on a package of bacon lately? Take a look next time you get a chance. There’s more there than just the fat and the protein. I am as weak on the subject of bacon as the next guy and my favorite vegetable is the polish sausage wrapped in bacon that is sold on a big bun by the charming lady from a cart down by the bus stop. But, I have studied the matter and there is more there to alarm a vegan than just fat and protein! A friend of mine has created his own version of the blue plate special at Costco with their $1.50 hot dog-and-a-cola combo with all you can eat condiments which is a lot. He has a few extra pounds on but if he limited himself to the meat portion of the bargain meal, he could easily lose 10 lbs. in a month. Dr. Budwig pointed to the difference between visceral fat and subcutaneous fat and how they metabolize differently in a weight-loss regimen. She also said that her experiments showed that “bad fats” block the metabolism of good fats. Her advice: stick to the good fats and the bad fats will fade away. I don’t think a doughnut contains any good fat. The problem remains, however, why does Homo sapiens scorbicus (var.) crave sugar? Also, why homo sapiens crave sugar isn’t that big of a mystery. Many anthropologists and epidemiologists who study the trends in societies notice things. Carbohydrates in their many forms can and do fatten us up barring specific genetics (a person whose body disposes of glucose very efficiently, for instance). From there, just ask yourself where and when it would he helpful for a human to have fat and you have your answer. Here’s a hint, it’s similar to the bear situation you named. But as you stated as we do not do the long fasts (nor do we do appropriate nightly fasts for the most part as most people do not sleep enough or according to biorhythms), hence, chronic obesity. It’s just one of the discrepancies of modern living, we still crave what we do not necessarily need, unless we eat as if we do not need it (most people on long-term low-carbohydrate diets lose their cravings for sugar/starch). This would make Colpo’s head spin in low-carb, scientific agony. If the interaction term is significant enough to affect the way that conclusion is written, it is significant enough to be plotted so we can see exactly what effect it does have. If it is not significant enough to be discussed in the paper, then the term should be removed from the model and the researcher has to live with the higher error term that s/he gets. At least that is the way I would like to see it done. The problem with the above model, and every one for that matter, is that a casual reader will assume that the outcome has been caused by the factors in the model. Outcomes are CAUSED by the carb amount, and outcomes are CAUSED by the weight loss. This thinking is what encourages “evidence-based” adherents to declare that the research shows that the positive outcomes are caused by the weightloss because that is the answer that they want it to be. As in stepwise regression, they would pick weightloss as their first and only term in the model, and assume because adding a second term, carb, wouldn’t add much to the model because it is highly correlated to the first factor, that it is not a “cause”. 1. The figure of TAG vs. CHO that I indicates that you don’t need an interaction term; carbohydrate is what controls TAG. All of us “already know about that” and “some of us” say it in print. 3. An important flaw that I did not mention is using “weight loss” altogether. Weight loss does not happen spontaneously, it is not primarily a cause, it is primarily a response. Referring to weight loss is another informercial, more subtle that ‘healthy’ but nonetheless selling something. A sensible scientific analysis would have compared carbohydrate restriction with calorie reduction because those are the independent variables, that is what the experimenter changed. Those are the stimuli in the experiment. The effect after the calorie reduction period is not even reported as it should have been. 4. The model is that calories reduce weight and the reduced adipose tissue releases hormones which affect TAG. This is reinforced by giving you the privilege of not looking at reduced CHO or insulin although the actual impact of Krauss’s study is to show that this is a bad idea. The ADA does this so that it can say that weight loss is most important rather than blood glucose which everybody knows is primarily controlled by dietary carbohydrate. 5. I think we have reached a critical mass scientifically. Dietary carbohydrate directly, or indirectly through insulin, is the primary control of weight loss and atherogenic dyslipidemia. Not to mention weight loss – if it’s muscle or bone mass – is unrelated to the desired effect of fat loss, which most believe is the desired outcome. Ah, the heart of the matter. If you are trying to discover the driver of all the other things, it would be nice to test for it. Putting weight loss in the driver’s seat (after presumably just removing it from the analysis as a noise variable) puts all the “weight” on the fat person with the bad behaviors. Just curious, who was the editor at the time the original study was published? It’s not the editor’s jobs to find the misleading presentation, at least without input from the reviewers. That’s what the reviewers are supposed to do. Can you suggest a doctoral program for Nutrition or related discipline where there is cutting edge research being conducted by faculty on Ketogenic diets? @Suzanne, Jeff Volek is at UConn and he’s been way out in front on ketogenic diets (for metabolic syndrome, not epilepsy) for a good while now. and they may have other leads. Have you had any experience with Bastyr? Perhaps talking to a graduate would be helpful to Suzanne. Maureen Williams, ND, received her bachelor’s degree from the University of Pennsylvania and her Doctorate of Naturopathic Medicine from Bastyr University in Seattle, WA. She has a private practice in Quechee, VT, and does extensive work with traditional herbal medicine in Guatemala and Honduras. Our HQ is not far from BU and I sometimes chat with them at the supermarket. Lu makes some good observations. On the question of the bears, I have found references to human hibernation and fasts extending beyond a month. I am sufficiently moved by my natural curiosity to place the subject of human hibernation on my list of things to investigate. It would seem that in an ice age or at high altitude, Homo sapiens dormer might have an adaptive capacity to “hole up” during bad weather. A factor to look into is whether Inuit People and Polar Bears “lard up” for the winter and if so, on what sort of a diet. In the case of the Inuit, larding up the larder might involve blocks of blubber in place of adding adipose. I agree with Lu on the necessity of incorporating “biorhythms” into our calculations. The circadian clock that governs human urges can easily be disrupted by our improvidence. As an example, when we retire with a cup’a cocoa, late insulin secretion into the blood is the result. Biochemists of my acquaintance inform me that high insulin interferes with the normal circadian mediated nocturnal flows of HGH, and creates the mayhem that ensues. The known fact that some people wake up “like bears in the springtime” should be added to a cliche dictionary if it isn’t there already. It is my experience that grazers are seldom anxious for a meal or excited by the wonderful aromas that issue from a well-conducted kitchen, but they are always snacking on something and some of them are in danger of becoming obese. Now, the 3 square meals a day types seem to have an appetite for the meals as the time nears, but, the vegans and vegetarians I know (and Mainland Chinese) seem to be eating something all the time and never have any cravings that I can perceive but do seem to favor things like bran muffins, supersweet corn, bananas and grapes. If Lu knows of a population that doesn’t crave sweets (chocolate, tobacco, gum), maybe they could be persuaded to answer a questionnaire for the general edification. I think the craving thing was pretty well explained by Saunders and Ross (and Wells) but the metabolic stimulus is elusive, very basic, and easy to conflate with addictions, don’t you agree? Lendon Smith called a low blood sugar attack the “all gone” feeling. That falls short of a description of “hunger” or “a healthy appetite”. Al, in my biochem text it is suggested that bears may be able to synthesize essential amino acids from urea during hibernation. My 1973 nutrition text states that these amino acids are essential because we synthesize them too slowly to meet replacement needs, not because we cannot synthesize them. Apparently PNG highlanders on low protein diets have gut flora that supplies missing amino acids . This suggests the mechanism for the other suggestions (plus, methionine can be supplied by recycling homocysteine).